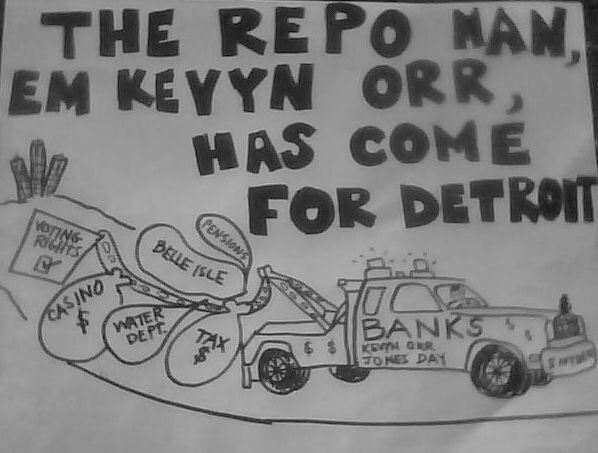 Illinois Supreme Court: Retiree health benefits must not be reduced » Cancel Detroit’s Debt To The Banks! Illinois pensions, like Michigan’s, are constitutionally protected. CHICAGO • The Illinois Supreme Court on Thursday sided with retired state employees who argue that health insurance coverage is a constitutionally-protected retirement benefit, a ruling that could portend trouble for landmark legislation aimed at fixing the worst funded state pension system in the nation. The court’s 6-to-1 ruling reverses a lower court decision that effectively allowed the state government to require retirees to pay for a portion of their own health care. The justices sent the case back to the lower court, where retirees can proceed with their challenge. The ruling centered on the strength of the constitutional protection for state worker benefits, such as health care and pensions. It was quickly parsed for the signals it sends on an even bigger case: a challenge to the state’s sweeping pension overhaul aimed at fixing a nearly $100 billion unfunded pension liability. Unions and retirees are suing over the broader overhaul plan that also reduces some benefits to retirees. “If the Court’s decision is predictive, the challenge of reforming our pension systems will remain,” the Chicago Democrat, who supported the pension overhaul, said in a statement following the ruling. Both cases pivot on a clause of the constitution that states that membership in a government pension or retirement system “shall be an enforceable contractual relationship, the benefits of which shall not be diminished or impaired.” But opinions varied on whether Thursday’s ruling was a sure signal of how the justices would rule on the larger pension challenge. “As far as a pennant waving in the wind (Thursday’s ruling) certainly suggests the Illinois Supreme Court feels it’s a very strong pension guarantee clause,” said Professor Ann Lousin of the John Marshall Law School in Chicago. But she said it was far from the final word on the issue. But Illinois Attorney General Lisa Madigan said the arguments in the two cases are different. The state is arguing that it can use its emergency powers to reduce benefits in times of fiscal crisis. Her father, House Speaker Michael Madigan, was a chief architect of the pension overhaul. Democratic Gov. Pat Quinn’s office also released a statement backing the constitutionality of the pension law. “We’re confident the courts will uphold this critical law that stabilizes the state’s pension funds while squarely addressing the most pressing fiscal crisis of our time by eliminating the state’s unfunded pension debt,” said Quinn spokesman Grant Klinzman. “Retirement security, including affordable health care and a modest pension, cannot be revoked by politicians,” AFSCME Council 31 executive director Henry Bayer said. At issue in the decision Thursday was a law passed in 2012 that allows the state to collect premiums from retirees for their state-subsidized health care. Prior to that, state workers who retired with 20 or more years of service were entitled to premium-free health insurance. 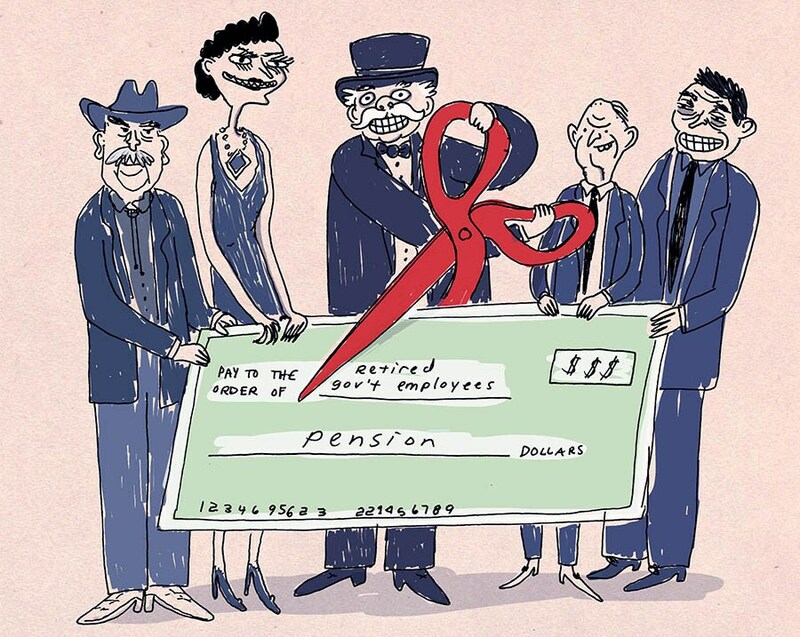 Under the new law, retirees had to cover part of the cost. The state argued insurance benefits are different from pensions and not protected by the constitution. But, writing for the majority, Justice Charles Freeman said the “plain and ordinary meaning” of language in the constitution supports the conclusion that health insurance premium subsidies are part of a contractual relationship with retirees that can’t be diminished. In a dissent, Justice Anne Burke took a stricter view. “The pension protection clause protects pensions, not subsidized health care premiums,” Burke wrote.